Award-winning food writer Bee Wilson's secret history of kitchens, showing how new technologies - from the fork to the microwave and beyond - have fundamentally shaped how and what we eat. Since prehistory, humans have braved sharp knives, fire, and grindstones to transform raw ingredients into something delicious--or at least edible. But these tools have also transformed how we consume, and how we think about, our food. In Consider the Fork, award-winning food writer Bee Wilson takes readers on a wonderful and witty tour of the evolution of cooking around the world, revealing the hidden history of objects we often take for granted. Technology in the kitchen does not just mean the Pacojets and sous-vide machines of the modern kitchen, but also the humbler tools of everyday cooking and eating: a wooden spoon and a skillet, chopsticks and forks. Blending history, science, and personal anecdotes, Wilson reveals how our culinary tools and tricks came to be and how their influence has shaped food culture today. 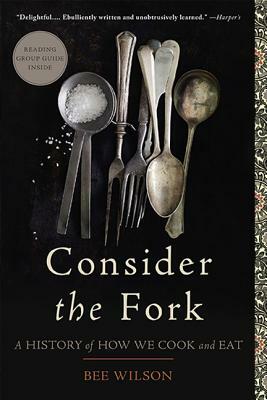 The story of how we have tamed fire and ice and wielded whisks, spoons, and graters, all for the sake of putting food in our mouths, Consider the Fork is truly a book to savor. Bee Wilson is a celebrated food writer, food historian, and author of five books, including The Way We Eat Now: How the Food Revolution Has Transformed Our Lives, Our Bodies, and Our World and First Bite: How We Learn to Eat and Consider the Fork: A History of How We Cook and Eat. She has been named BBC Radio's food writer of the year and is a three-time Guild of Food Writers food journalist of the year. She writes a monthly column on food in the Wall Street Journal. She lives in Cambridge, England. the unsung implements that have helped shape our diets through the centuries.